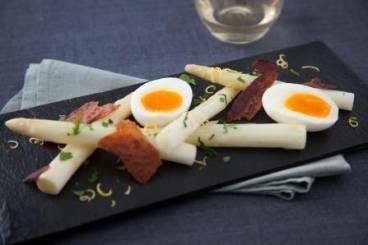 Woody white asparagus with rich soft boiled hens eggs, crispy pancetta and zesty gremolata. Trim the ends off the asparagus and then peel. Bring a pot of water to the boil and add the salt and half of a lemon. Cook the asparagus for 5-6 minutes (depending on the size) or until tender. Drain and whilst still hot, roll in the butter and season with Maldon sea salt. Place the eggs into boiling water and cook for 6 minutes. Drain and run under cold water. When cool, peel and keep whole. Lay the pancetta slices on a tray between two sheets of grease proof paper and place another tray on top. Bake in the oven until crispy. Remove from the tray and lay onto tissue to soak up any excess fat. Zest the lemon. Peel and finely chop or puree the garlic. Pick the leaves from the parsley and slice finely (chiffonade). Mix together with salt and adjust amounts to taste. Lay the asparagus on a plate. Cut the egg in half length ways and place on top of the asparagus. Lay the pancetta on top of each egg and finish the plate with a sprinkle of gremolata.